Status: Restoration completed 2014, and returned home to its owner. 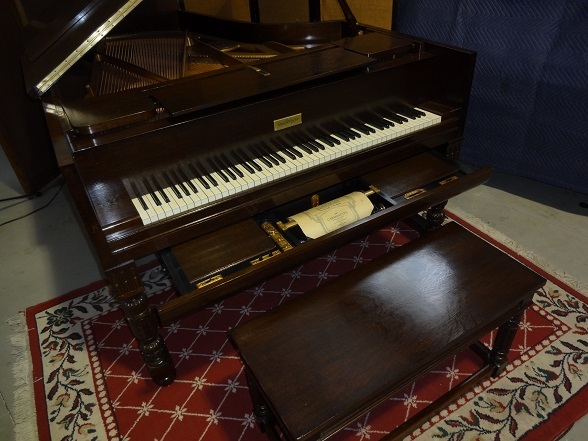 This unusual "Harpsichord" Artcase dark oak Chickering 6'6" was purchased from its original owner's family by its new owner in late 2013 in original but unrestored condition. The instrument was sent to Historic Pianos in early 2014 for complete restoration of both the piano and player. The Ampico player had reportedly not functioned for more than 50 years, and the piano itself had not been playable for more than a decade. Sections of missing oak veneer and damaged case parts were repaired and custom-stained to match the original dark oak. The undamaged original inlaid casework was thoroughly cleaned and the original open-pore French polish lacquer finish was refreshed to blend with the repaired sections. The matching bench was also repaired, replacing missing sections of wood moldings and missing veneer. The instrument was fully restored with a new pinblock, repaired and refinished soundboard and bridges, and new rescaled custom strings. The action was fully restored, with cleaned and polished ivories, new Abel hammers, and fully rebalanced action weighting. The late Ampico A player was fully restored to like-new condition, including motor, pump, stack and drawer. The nearby video links show how a larger instrument with a big dynamic volume and tone range can showcase the performance of a top-notch reproducing player.